Mike and I recently celebrated our 15th wedding anniversary. Thanks to my parents (aka Donald and Daisy), we were able to take a kids-free, long weekend trip to Disney World. We tried to take advantage of this opportunity and hit up some restaurants that may not be as appealing to Anna and Elsa. I have been dying to try Sanaa for years. Just reading about the bread service with the dipping sauces and spreads was enough to capture my interest, but the chance to order creative entrees with flavors we don’t normally get to try sealed the deal. Sanaa is one table service credit on the Disney Dining Plan. With entrees that routinely run into the $30+ range, this is a restaurant that can present a compelling value for your dining plan credits. Of course, it just depends on what entrees you order. Sanaa is located at Animal Kingdom Lodge in the Kidani Village section. 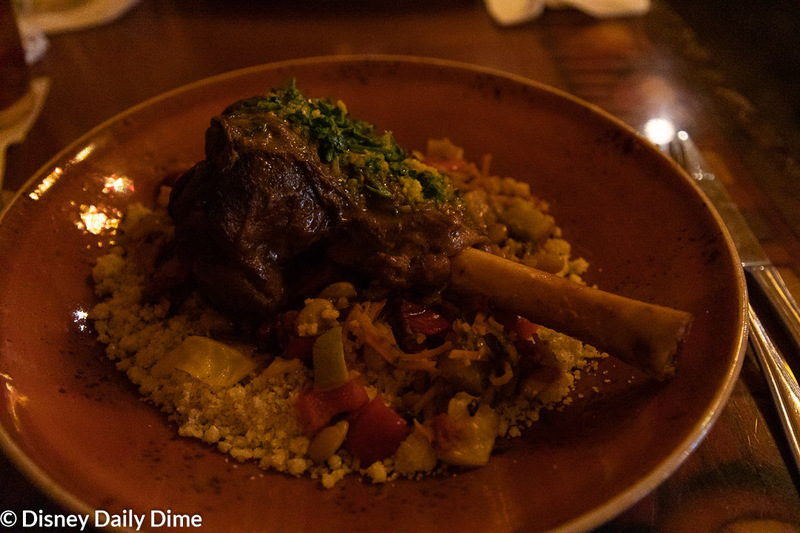 We planned a day at Animal Kingdom and booked this meal for that evening, as it is just a quick bus ride over to the resort. 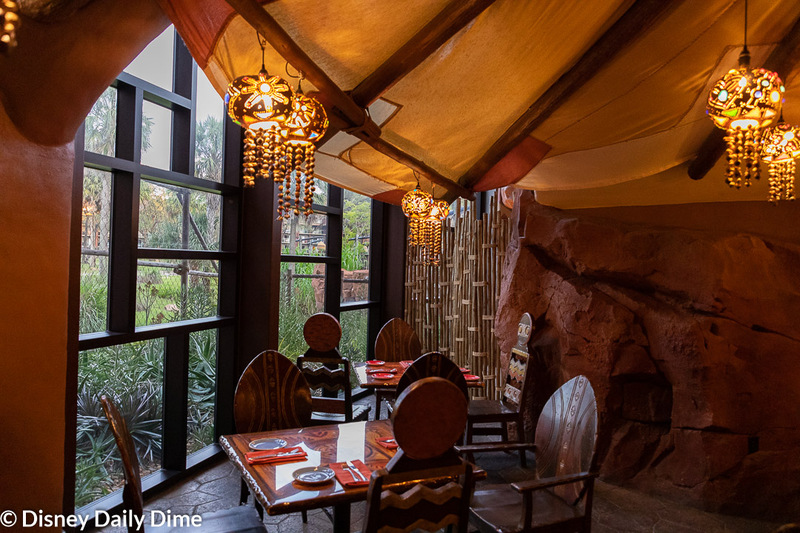 Eating at Sanaa gave us a chance to check out the Lodge, specifically Kidani Village where Sanaa is located. We got here early so we could take in the savanna before we checked in for our meal. If you can take the time in your schedule, I highly recommend doing this as it was a relaxing way to begin the evening. We enjoyed watching the giraffes and other animals running towards the truck that was delivering their dinner!!! Sanaa in Swahili means “art” or “work of beauty” and there is no doubt that the Imagineers chose the name on purpose. We were in awe of the picturesque décor in Sanaa. 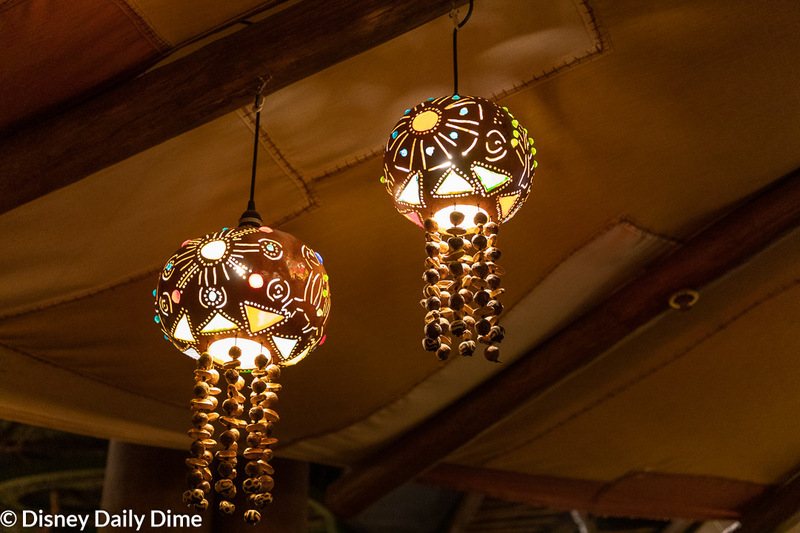 Native African art, columns that look like tree trunks leading up to the leaves covering the ceiling above and dark wood features create a vibrant atmosphere. All of this is meant to evoke a traditional spice market, decorated with handcrafted wares under the graceful branches of an acacia tree. We’ve never been to a spice market in East Africa, so we’ll have to trust Disney knows what they are doing here. In any case, it’s a beautifully themed restuarant. Huge windows offer great views of the savannah and the animals on it. However, if you aren’t seated at the few tables in front of these windows, the view isn’t great. The restaurant is on the smaller side but it mostly an open plan with a few niches created by curved walls. There is also a bar and lounge area inside the restaurant. Our sever, Amy, was pleasant and extremely helpful. 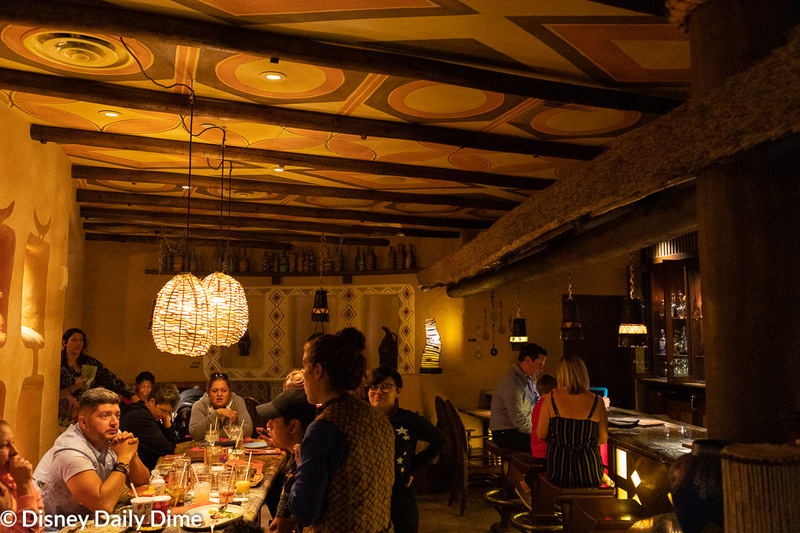 As the restaurant features African and Indian inspired food, many people who come here more than likely have many questions about the food. Amy was a great resource, giving her recommendations and even asking us questions about what we liked (mainly what level of spice and heat we can tolerate!) in order to give the best advice on what to order. Her recommendations were spot on as Mike and I both loved our meals as you will read below. We had a little hiccup with the dreaded uneven, wobbly table. Amy and another server helped balance it out and even came a second time to tweak it when it was still unstable. We appreciated the assistance and their determination to not let the table be a distraction during our meal. 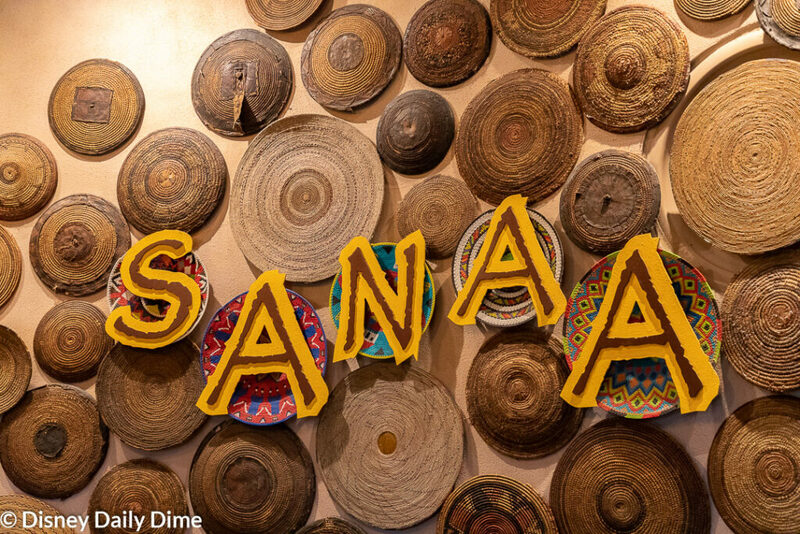 In general, Sanaa touts itself as celebrating “African cooking with Indian flavors”. We think if you are a fan of Tusker House, this will be another restaurant that you will like. 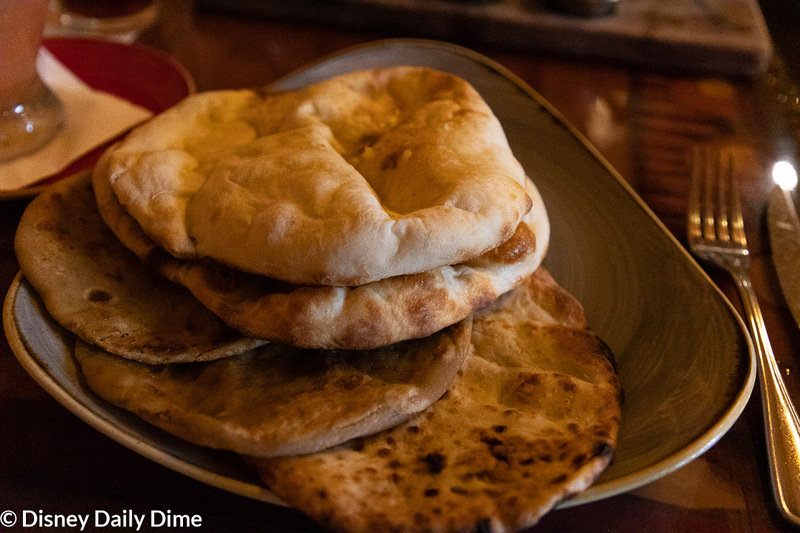 In addition to the flavors you will find here, we should also note that the vegetarian options here are some of the more robust ones you will find in Disney World. New let’s look at our meal! We decided we’d each have a drink while eating at Sanna. My non-alcoholic grapefruit spritzer was refreshing and came in handy to cut some of the heat from my Spicy Durban Shrimp. 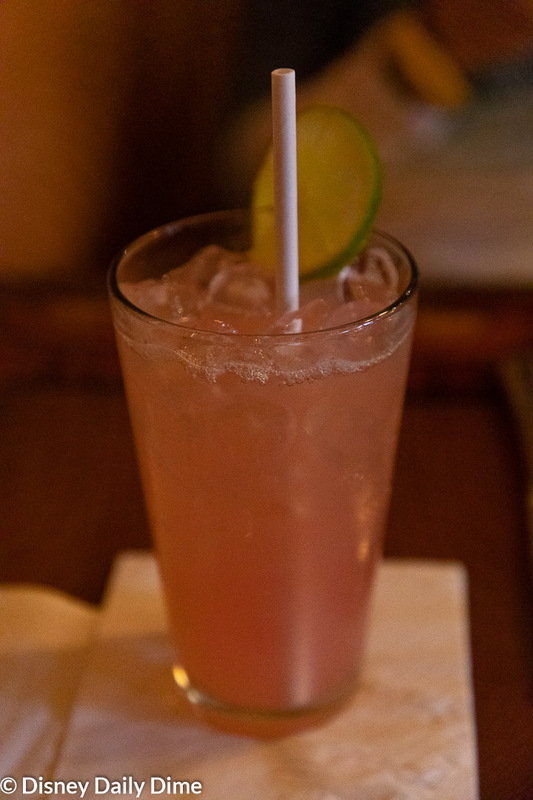 Mike ordered a watermelon margarita that he described as strong and not too cloyingly sweet from the watermelon. 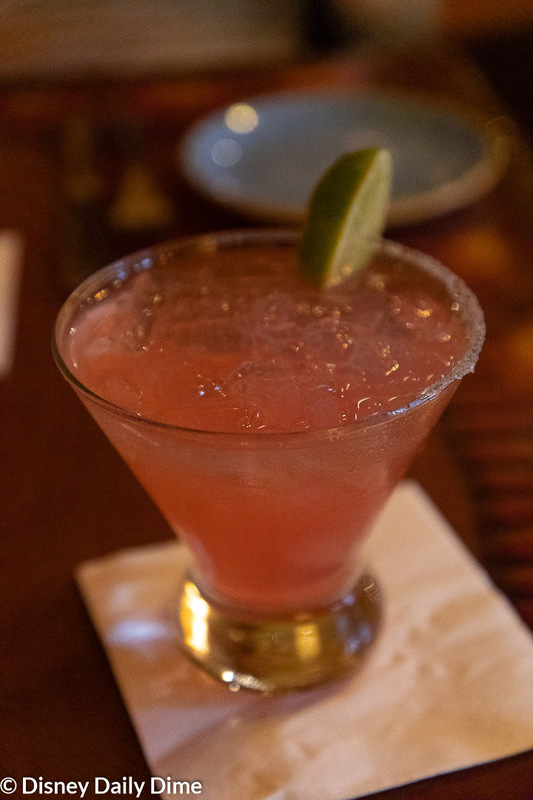 He felt it was a good twist on a traditional margarita and also balanced the flavors from the appetizers and entrée. There was no question that Mike and I were going to start the meal with Sanaa’s renowned and legen–wait for it-dary bread service. We hope you enjoyed our How I Met Your Mother reference. We loved that show. Mike was delivered a plate with five different types of bread that were light and fluffy. Even though I was eating gluten free, I wasn’t left out as I was given gluten free naan bread to enjoy. The server that delivered the bread service walked us through the nine accompaniments to the bread. 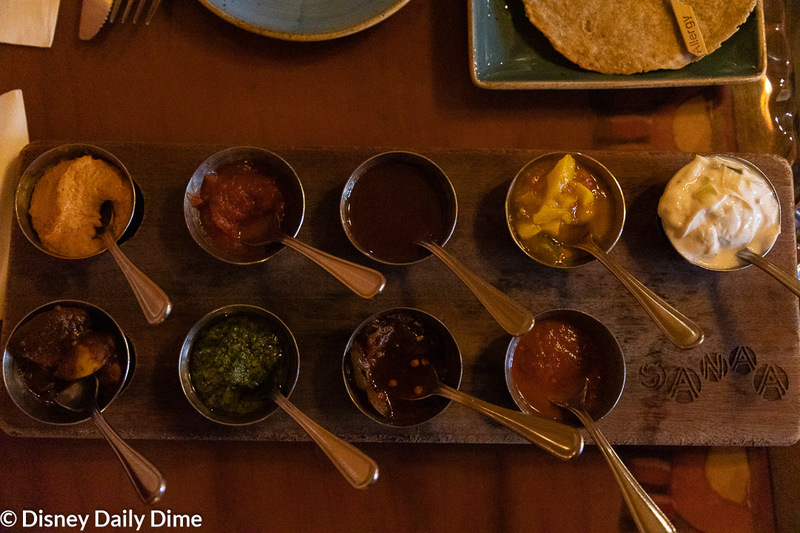 They are organized on the beautiful wooden serving block in order by spiciness starting with the cucumber raita and ending with the red chile sambal. 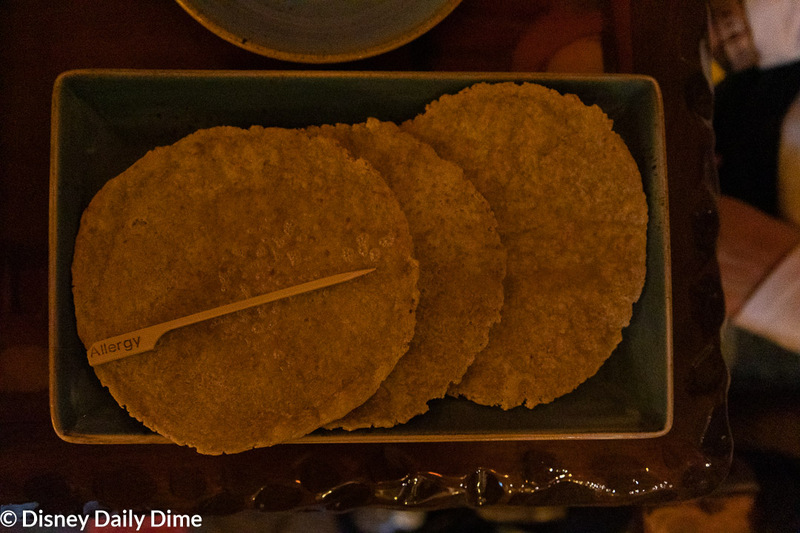 The other six dips varied in flavors and each one was amazing in its own right. There is a reason that Sanaa is known for this, and it didn’t disappoint at all. For his entrée, Mike selected the Bebere-braised Lamb Shank, served with Krummel Pap and Summer Garden Chakalaka. The lamb shank was fork tender and fell easily off the bone. This is how it should be, as Sanaa makes a big to-do on it’s website page that that it’s meats are slow cooked. Mike loved the lamb and commented that it wasn’t gamey and was a high-quality cut of meat. He loved the vegetables in the chakalaka (vegetable relish) however the Krummel Pap wasn’t for him. He isn’t a fan of couscous, grits, quinoa, polenta, etc so it was definitely more a personal preference than the dish itself. As I was eating gluten free, I was presented with an allergy menu so I could choose an entrée that was gluten friendly. I was immediately intrigued with the Potjie Inspired, where you can choose two servings of meat or vegetarian dishes. 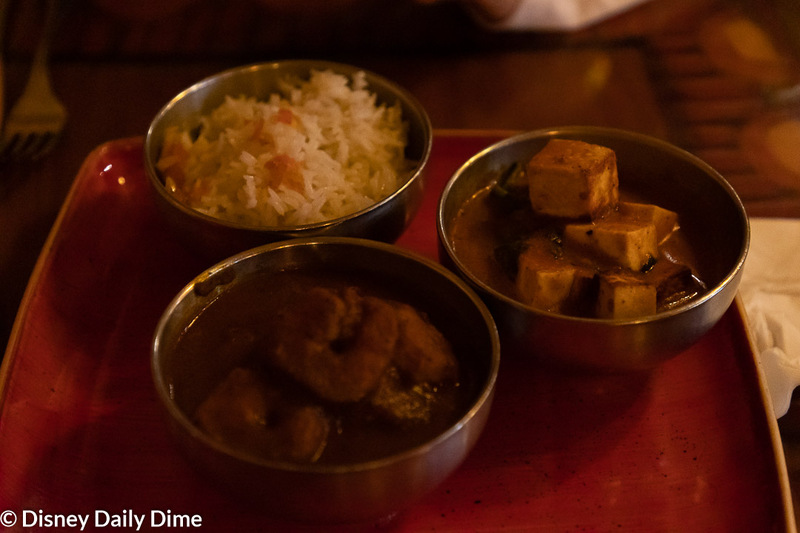 With our server Amy’s guidance, I chose the Spicy Durban Shrimp and the Paneer Tikka. In short, they were both amazing. Mike even tried the shrimp and had food envy. The shrimp was served in a spicy sauce giving it almost a stew like quality. They were cooked perfectly and I could have drank the rest of the sauce as it tasted so good. The Paneer Tikka was delicious also, but the cheese did get heavy after awhile and the spice blend wasn’t as much to my liking. Given that most spicy dishes at Disney World restaurants still tend to be on the bland side of spicy, it was a pleasant change to actually eat spicy food that had a pleasing kick to it. We were too full from the two outstanding courses to order dessert, but the drinks we enjoyed with our dinner provided a sweet accompaniment to our meal. Mike and I thoroughly enjoyed our meal at Sanaa. As these dishes and flavors aren’t what we usually eat at home, we relished the opportunity to try something new. We will eat here again and bring the girls the next time as we noted that the menu had plenty of options for the less adventurous palates. 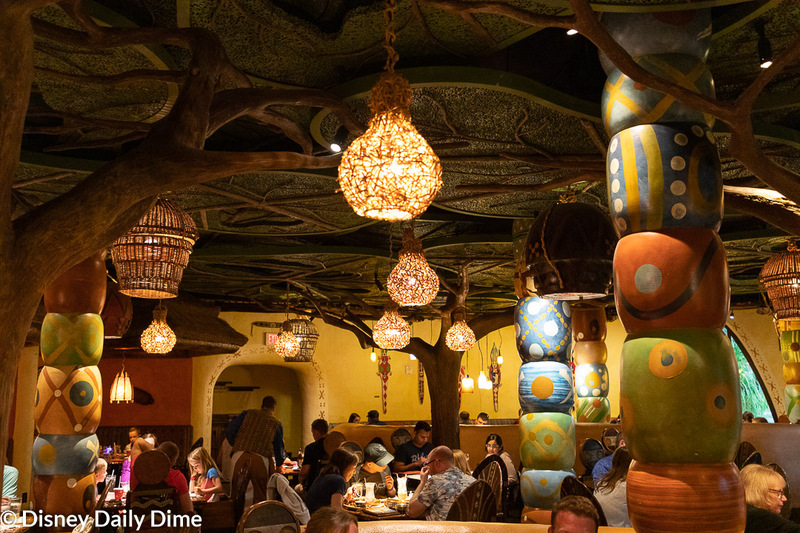 The high quality of the food sets Sanaa apart from many Disney World eateries. While not quite at the level of Morimoto Asia, it was still fantastic. Yes, some of the spices and flavors may be unfamiliar, but they are presented in a way that is very approachable. Sanaa is located in a resort that is out of the way from most of Disney World. This and the fact that it was packed when we left, speaks to the popularity and following this restaurant has. With that, we’ll wrap up our Sanaa review. 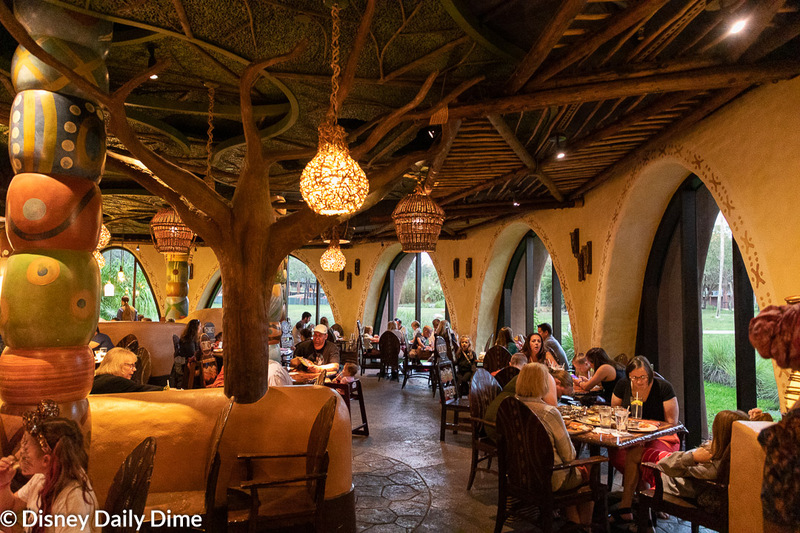 A great restaurant located over at Animal Kingdom Lodge, we highly recommend this restaurant. It’s a great place to try some unique and flavorful meals and possibly branch a little out of your comfort zone. If our Sanaa review was helpful, or at least entertaining, please like and share this with your friends or anyone you think will find it useful. Just use the sharing buttons on the page. We always appreciate it when you share our posts, as it allows us to spread the word about our young blog and hopefully allows us to help others.